Abstract: Publication date: June 2019Source: ISPRS Journal of Photogrammetry and Remote Sensing, Volume 152Author(s): Akash Ashapure, Jinha Jung, Junho Yeom, Anjin Chang, Murilo Maeda, Andrea Maeda, Juan Landivar Recent years have witnessed enormous interest in the application of Unmanned Aerial Systems (UAS) for precision agriculture. This study presents a novel approach to use multi-temporal UAS data for comparison of two management practices in cotton, conventional tillage (CT) and no-tillage (NT). The plant parameters considered for the comparison are: canopy height (CH), canopy cover (CC), canopy volume (CV) and Normalized Difference Vegetation Index (NDVI). Initially, the whole study area was divided into approximately one square meter size grids. Measurements were extracted grid wise using high resolution UAS data captured ten times over whole crop growing season of the cotton. One tailed Z-test hypothesis reveals that there is a significant difference between cotton growth under CT and NT for almost all the epochs. With 95% confidence interval, the crop grown under NT found to have taller canopy, higher canopy cover, bigger biomass and higher NDVI, as compared to those under CT cropping system. Abstract: Publication date: June 2019Source: ISPRS Journal of Photogrammetry and Remote Sensing, Volume 152Author(s): Morteza Ghahremani, Yonghuai Liu, Peter Yuen, Ardhendu Behera In this paper, we propose a compressive sensing-based method to pan-sharpen the low-resolution multispectral (LRM) data, with the help of high-resolution panchromatic (HRP) data. In order to successfully implement the compressive sensing theory in pan-sharpening, two requirements should be satisfied: (i) forming a comprehensive dictionary in which the estimated coefficient vectors are sparse; and (ii) there is no correlation between the constructed dictionary and the measurement matrix. To fulfill these, we propose two novel strategies. The first is to construct a dictionary that is trained with patches across different image scales. Patches at different scales or equivalently multiscale patches provide texture atoms without requiring any external database or any prior atoms. The redundancy of the dictionary is removed through K-singular value decomposition (K-SVD). Second, we design an iterative l1-l2 minimization algorithm based on alternating direction method of multipliers (ADMM) to seek the sparse coefficient vectors. The proposed algorithm stacks missing high-resolution multispectral (HRM) data with the captured LRM data, so that the latter is used as a constraint for the estimation of the former during the process of seeking the representation coefficients. Three datasets are used to test the performance of the proposed method. A comparative study between the proposed method and several state-of-the-art ones shows its effectiveness in dealing with complex structures of remote sensing imagery. Abstract: Publication date: June 2019Source: ISPRS Journal of Photogrammetry and Remote Sensing, Volume 152Author(s): Dalin Jiang, Bunkei Matsushita, Fajar Setiawan, Augusto Vundo The Secchi disk depth (ZSD) is a widely used parameter for evaluating water clarity. Here we propose an improved algorithm, which is based on a new underwater visibility theory, for retrieving more accurate ZSD from remote sensing reflectance (Rrs) in various waters. Two improvements were carried out in the new algorithm. First, we used a hybrid quasi-analytical algorithm (QAA_hybrid) instead of the sixth version of QAA (QAA_v6) for retrieving more accurate total absorption coefficient (aλ) and total backscattering coefficient (bbλ) even in turbid inland waters. Second, we used a dynamic KT/Kd ratio (i.e., ratio of diffuse attenuation coefficient of upwelling radiance and diffuse attenuation coefficient of downwelling irradiance) instead of using the fixed ratio (i.e., 1.5). The results obtained from in situ Rrs show that the improved ZSD estimation algorithm gave more accurate ZSD estimations, with the root mean square error (RMSE) reduced from 0.2 to 0.1 in log10 unit, mean absolute percentage error (MAPE) reduced from 39% to 20% (N = 178 with in situ ZSD values between 0.3 and 20.8 m). We then applied the improved ZSD estimation algorithm to the 2003–2012 MERIS images for Lake Kasumigaura to further confirm the performance of the improved ZSD estimation algorithm. The results obtained from 19 matchups demonstrate that the estimated ZSD matched well with the in situ ZSD, with the RMSE of 0.11 m and the MAPE of 15%. The improved ZSD estimation algorithm shows a potential to estimate more accurate ZSD values from remote sensing data in various waters. Abstract: Publication date: May 2019Source: ISPRS Journal of Photogrammetry and Remote Sensing, Volume 151Author(s): Anza Shakeel, Waqas Sultani, Mohsen Ali In this paper, we attempt to address the challenging problem of counting built-structures in the satellite imagery. Building density is a more accurate estimate of the population density, urban area expansion and its impact on the environment, than the built-up area segmentation. However, building shape variances, overlapping boundaries, and variant densities make this a complex task. To tackle this difficult problem, we propose a deep learning based regression technique for counting built-structures in satellite imagery. Our proposed framework intelligently combines features from different regions of satellite image using attention based re-weighting techniques. Multiple parallel convolutional networks are designed to capture information at different granulates. These features are combined into the FusionNet which is trained to weigh features from different granularity differently, allowing us to predict a precise building count. To train and evaluate the proposed method, we put forward a new large-scale and challenging built-structure-count dataset. Our dataset is constructed by collecting satellite imagery from diverse geographical areas (planes, urban centers, deserts, etc.,) across the globe (Asia, Europe, North America, and Africa) and captures the wide density of built structures. Detailed experimental results and analysis validate the proposed technique. FusionNet has Mean Absolute Error of 3.65 and R-squared measure of 88% over the testing data. Finally, we perform the test on the 274.3×103 m2 of the unseen region, with the error of 19 buildings off the 656 buildings in that area. Abstract: Publication date: May 2019Source: ISPRS Journal of Photogrammetry and Remote Sensing, Volume 151Author(s): Langning Huo, Xiaoli Zhang Voxelization is an efficient and frequently used data process that is applied to terrestrial laser scanning (TLS) data to facilitate data management and reduce storage size. In this study, an innovative method of equiangular sectorial voxelization is presented based on the distinctive point distribution characteristic of single-scan TLS. It has the function of containing the same number of laser beams going through each voxel, which results in metrics that can be applied to delineate forest conditions. To verify the effectiveness of the new voxelization method and to illustrate its application, 48 plots and 1098 individual trees with different degrees of defoliation were scanned using single-scan TLS. Their defoliation could be linearly regressed by using only point density metrics derived from this new shape of voxels. A 0.89 R2 value and a 12 RMSE (% of defoliation) were obtained for individual-tree-scale estimation, and a 0.83 R2 value and a 12 RMSE (% of defoliation) were obtained for plot-scale estimation. We conclude that the new voxelization method was effective, and the point density that was thus calculated was an efficient feature that revealed forest attributes. Abstract: Publication date: May 2019Source: ISPRS Journal of Photogrammetry and Remote Sensing, Volume 151Author(s): Xiurui Geng, Luyan Ji, Yongchao Zhao With the development of remote sensing technology, more and more multi-temporal multispectral imagery becomes easily available, thus the research of target detection for this type of data will become indispensable. However, the traditional technology of target detection is generally designed for the single-temporal data. In this paper, we introduce the multilinear function as a mathematical tool to deal with the multi-temporal target detection problem for the first time. For an M time phases multispectral data set, we design an Mth-order tensor filter, which corresponds to an M-linear function, to minimize the filter output energy while keeping the target output value invariant, named filter tensor analysis (FTA). Experiments using Landsat time series with two temporally changed targets (i.e. farmland and airport) and two temporally constant targets (i.e. roof and reservoir) all show the effectiveness of FTA for multi-temporal target detection under several commonly used evaluation indices. 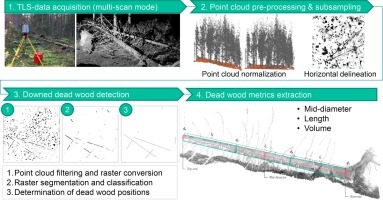 Abstract: Publication date: May 2019Source: ISPRS Journal of Photogrammetry and Remote Sensing, Volume 151Author(s): Yanan Liu, Weishu Gong, Yanqiu Xing, Xiangyun Hu, Jianya Gong Accurate mapping the forest stand mean height (FSMH) and aboveground biomass (AGB) with a high spatial resolution are important for monitoring carbon stocks on Earth and the variability and trends of terrestrial carbon fluxes. The recently launched Sentinel-1 (SAR) and Sentinel-2 (multispectral) missions offers a new opportunity to map FSMH and AGB. Here we present a methodological framework to map the FSMH and AGB at a resolution of 10 m in Yichun, Northeast China, by integrating field plots, Sentinel imagery, topographic data, and national geographical conditions monitoring data. First, a spatial continuous FSMH product was retrieved using an empirical model, which adopts the backscattering of SAR Sentinel-1B and the fraction of vegetation cover (FVC) variable from multispectral Sentinel-2A imagery. Subsequently, three AGB estimation models were developed for different forest types to link the field measurements to the FSMH, biophysical variables, spectral vegetation index, and topographic variables using the random forest algorithm. The mapping results show that the FSMH estimated using SAR backscatter values from VH polarization is more robust and accurate than that based on VV polarization. Furthermore, the three AGB estimation models based on three different forest types perform better than the model built by grouping all forest types together. The determination coefficient (R2) and root-mean-squared error (RMSE) range from 0.69 to 0.74 and 23.38 Mg/ha to 24.21 Mg/ha, respectively. Overall, our study demonstrates that the proposed methodological framework can be used to map the FSMH and AGB products at a high spatial resolution utilizing freely accessible Sentinel-1 SAR and Sentinel-2 multispectral imagery. Abstract: Publication date: May 2019Source: ISPRS Journal of Photogrammetry and Remote Sensing, Volume 151Author(s): Wenzhi Zhao, Yanchen Bo, Jiage Chen, Dirk Tiede, Blaschke Thomas, William J. Emery Urban scenes refer to city blocks which are basic units of megacities, they play an important role in citizens’ welfare and city management. Remote sensing imagery with largescale coverage and accurate target descriptions, has been regarded as an ideal solution for monitoring the urban environment. However, due to the heterogeneity of remote sensing images, it is difficult to access their geographical content at the object level, let alone understanding urban scenes at the block level. Recently, deep learning-based strategies have been applied to interpret urban scenes with remarkable accuracies. However, the deep neural networks require a substantial number of training samples which are hard to satisfy, especially for high-resolution images. Meanwhile, the crowed-sourced Open Street Map (OSM) data provides rich annotation information about the urban targets but may encounter the problem of insufficient sampling (limited by the places where people can go). As a result, the combination of OSM and remote sensing images for efficient urban scene recognition is urgently needed. In this paper, we present a novel strategy to transfer existing OSM data to high-resolution images for semantic element determination and urban scene understanding. To be specific, the object-based convolutional neural network (OCNN) can be utilized for geographical object detection by feeding it rich semantic elements derived from OSM data. Then, geographical objects are further delineated into their functional labels by integrating points of interest (POIs), which contain rich semantic terms, such as commercial or educational labels. Lastly, the categories of urban scenes are easily acquired from the semantic objects inside. Experimental results indicate that the proposed method has an ability to classify complex urban scenes. The classification accuracies of the Beijing dataset are as high as 91% at the object-level and 88% at the scene level. Additionally, we are probably the first to investigate the object level semantic mapping by incorporating high-resolution images and OSM data of urban areas. Consequently, the method presented is effective in delineating urban scenes that could further boost urban environment monitoring and planning with high-resolution images. Abstract: Publication date: May 2019Source: ISPRS Journal of Photogrammetry and Remote Sensing, Volume 151Author(s): Yanfei Zhong, Yao Xu, Xinyu Wang, Tianyi Jia, Guisong Xia, Ailong Ma, Liangpei Zhang In mid- and high-latitude regions, district heating systems (DHSs) are major heat supply solutions to both local industry and citizens. Pipeline leakage detection is therefore important for monitoring the condition of DHSs and promoting energy efficiency. In this paper, a saliency analysis method is presented for DHS pipeline leakage detection using remotely sensed infrared imagery, visible imagery, and geographic information system (GIS) data. In the saliency-based DHS leakage detection method, the infrared saliency map is created to enhance the leakage targets, and the pipeline location information extracted from the GIS data or the visible imagery acts as a distribution prior to reject false alarms. Finally, adaptive target segmentation by maximum entropy permits the automatic detection of potential leakage targets in the final fused saliency map. The approach was validated on three data sets acquired in Gävle in Sweden and Datong in China, with the heating leakages indicated by human analysts and field validation. The leakage detection accuracy of the new approach with a reduced false alarm rate is better than the previous methods. The results suggest that the proposed approach for DHS leakage detection from remotely sensed thermal infrared data has great potential for monitoring DHS conditions in mid- and high-latitude regions. Abstract: Publication date: May 2019Source: ISPRS Journal of Photogrammetry and Remote Sensing, Volume 151Author(s): Zihan Liu, Wenfeng Zhan, Jiameng Lai, Falu Hong, Jinling Quan, Benjamin Bechtel, Fan Huang, Zhaoxu Zou Annual temperature cycle (ATC) models enable the multi-timescale analysis of land surface temperature (LST) dynamics and are therefore valuable for various applications. However, the currently available ATC models focus either on prediction accuracy or on generalization ability and a flexible ATC modelling framework for different numbers of thermal observations is lacking. Here, we propose a hybrid ATC model (ATCH) that considers both prediction accuracy and generalization ability; our approach combines multiple harmonics with a linear function of LST-related factors, including surface air temperature (SAT), NDVI, albedo, soil moisture, and relative humidity. Based on the proposed ATCH, various parameter-reduction approaches (PRAs) are designed to provide model derivatives which can be adapted to different scenarios. Using Terra/MODIS daily LST products as evaluation data, the ATCH is compared with the original sinusoidal ATC model (termed the ATCO) and its variants, and with two frequently-used gap-filling methods (Regression Kriging Interpolation (RKI) and the Remotely Sensed DAily land Surface Temperature reconstruction (RSDAST)), under clear-sky conditions. In addition, under overcast conditions, the LSTs generated by ATCH are directly compared with in-situ LST measurements. The comparisons demonstrate that the ATCH increases the prediction accuracy and the overall RMSE is reduced by 1.8 and 0.7 K when compared with the ATCO during daytime and nighttime, respectively. Moreover, the ATCH shows better generalization ability than the RKI and behaves better than the RSDAST when the LST gap size is spatially large and/or temporally long. By employing LST-related controls (e.g., the SAT and relative humidity) under overcast conditions, the ATCH can better predict the LSTs under clouds than approaches that only adopt clear-sky information as model inputs. Further attribution analysis implies that incorporating a sinusoidal function (ASF), the SAT, NDVI, and other LST-related factors, provides respective contributions of around 16%, 40%, 15%, and 30% to the improved accuracy. Our analysis is potentially useful for designing PRAs for various practical needs, by reducing the smallest contribution factor each time. We conclude that the ATCH is valuable for further improving the quality of LST products and can potentially enhance the time series analysis of land surfaces and other applications. Abstract: Publication date: May 2019Source: ISPRS Journal of Photogrammetry and Remote Sensing, Volume 151Author(s): Dong Lin, Malgorzata Jarzabek-Rychard, Xiaochong Tong, Hans-Gerd Maas Thermal image data are widely used to assess the insulation quality of buildings and to detect thermal leakages. In our approach, we merge terrestrial thermal image data and 3D point clouds to perform thermal texture mapping for building facades. Since geo-referencing data of a hand-held thermal camera is usually not available in such applications, registration between thermal images and a 3D point cloud (for instance generated from RGB image data by structure-from-motion techniques) is essential. In our approach, thermal image data registration is conducted in four steps: First, another point cloud is generated from the thermal image data. Next, a coarse registration between thermal point cloud and RGB point cloud is performed using the fast global registration (FGR) algorithm. The best corresponding thermal-RGB image pairs are acquired by picking up the lowest Euclidean distance between the exterior orientation parameters of thermal images and transformed exterior orientation parameters of RGB images. Subsequently, radiation-invariant feature transform (RIFT), normalized barycentric coordinate system (NBCS) and random sample consensus (RANSAC) are employed to extract reliable matching features on thermal-RGB image pairs. Afterwards, a fine registration is performed by mono-plotting of the RGB image, followed by image resection of the thermal image. Finally, in terms of texture mapping algorithms, in order to remove the blur effects caused by small misalignments for different candidate images, a global image pose refinement approach, which aims to minimize the temperature disagreements provided by different images for the same object points, is proposed. In addition, in order to ensure high geometric and radiant accuracy, camera calibrations are performed. Experiments showed that the proposed method could not only achieve high geometric registration accuracy, but also provide a good radiometric accuracy with RMSE lower than 1.5 °C. Abstract: Publication date: May 2019Source: ISPRS Journal of Photogrammetry and Remote Sensing, Volume 151Author(s): Hoang Long Nguyen, David Belton, Petra Helmholz Plane detection and segmentation is one of the most crucial tasks in point cloud processing. The output from this process can be used as input for further processing steps, such as modelling, registration and calibration. However, the sparseness and heterogeneity of Mobile Laser Scanning (MLS) point clouds may lead to problems for existing planar surfaces detection and segmentation methods. This paper proposes a new method that can be applicable to detect and segment planar features in sparse and heterogeneous MLS point clouds. This method utilises the scan profile patterns and the planarity values between different neighbouring scan profiles to detect and segment planar surfaces from MLS point clouds. The proposed method is compared to the three most state-of-the-art segmentation methods (e.g. RANSAC, a robust segmentation method based on robust statistics and diagnostic principal component analysis – RDCPA as well as the plane detection method based on line arrangement). Three datasets are used for the validation of the results. The results show that our proposed method outperforms the existing methods in detecting and segmenting planar surfaces in sparse and heterogeneous MLS point clouds. In some instances, the state-of-the-art methods produce incorrect segmentation results for façade details which have a similar orientation, such as for windows and doors within a façade. While RDCPA produces up to 50% of outliers depending on the neighbourhood threshold, another method could not detect such features at all. When dealing with small features such as a target, some algorithms (including RANSAC) were unable to perform segmentation. However, the propose algorithm was demonstrated to detect all planes in the test data sets correctly. The paper shows that these mis-segmentations in other algorithms may lead to significant errors in the registration process of between 1.047 and 1.614 degrees in the angular parameters, whereas the propose method had only resulted in 0.462 degree angular bias. Furthermore, it is not sensitive to the required method parameters as well as the point density of the point clouds. Abstract: Publication date: May 2019Source: ISPRS Journal of Photogrammetry and Remote Sensing, Volume 151Author(s): Jianfeng Huang, Xinchang Zhang, Qinchuan Xin, Ying Sun, Pengcheng Zhang Automated extraction of buildings from remotely sensed data is important for a wide range of applications but challenging due to difficulties in extracting semantic features from complex scenes like urban areas. The recently developed fully convolutional neural networks (FCNs) have shown to perform well on urban object extraction because of the outstanding feature learning and end-to-end pixel labeling abilities. The commonly used feature fusion or skip-connection refine modules of FCNs often overlook the problem of feature selection and could reduce the learning efficiency of the networks. In this paper, we develop an end-to-end trainable gated residual refinement network (GRRNet) that fuses high-resolution aerial images and LiDAR point clouds for building extraction. The modified residual learning network is applied as the encoder part of GRRNet to learn multi-level features from the fusion data and a gated feature labeling (GFL) unit is introduced to reduce unnecessary feature transmission and refine classification results. The proposed model - GRRNet is tested in a publicly available dataset with urban and suburban scenes. Comparison results illustrated that GRRNet has competitive building extraction performance in comparison with other approaches. The source code of the developed GRRNet is made publicly available for studies. Abstract: Publication date: May 2019Source: ISPRS Journal of Photogrammetry and Remote Sensing, Volume 151Author(s): Sugandh Chauhan, Roshanak Darvishzadeh, Mirco Boschetti, Monica Pepe, Andrew Nelson Rapid and quantitative assessment of crop lodging is important for understanding the causes of the phenomena, improving crop management, making better production and supporting loss estimates in general. Accurate information on the location and timing of crop lodging is valuable for farmers, agronomists, insurance loss adjusters, and policymakers. Lodging studies can be performed to assess the impact of lodging events or to model the risk of occurrence, both of which rely on information that can be acquired by field observations, from meteorological data and from remote sensing (RS). While studies applying RS data to assess crop lodging dates back three decades, there has been no comprehensive review of the status, potential, current approaches, and challenges in this domain. In this position paper, we review the trends in field/lab-based and RS-based studies for crop lodging assessment and discuss the strengths and weaknesses of current approaches. Theoretical background on crop lodging is presented, and the scope of RS in assessing plant characteristics associated with lodging is reviewed and discussed. The review focuses on RS-based studies, grouping them according to the platform deployed (i.e., ground-based, airborne and spaceborne), with an emphasis on analyzing the pros and cons of the technology. Finally, the challenges, research gaps, perspectives for future research, and an outlook on new sensors and platforms are presented to provide state-of-the-art and future scenarios of RS in lodging assessment. Our review reveals that the use of RS techniques in crop lodging assessment is still in an experimental stage. However, there is increasing interest within the RS scientific community (based on the increased rate of publications over time) to investigate its use for crop lodging detection and risk mapping. The existing satellite-based lodging assessment studies are very few, and the operational application of the current approaches over large spatial extents seems to be the biggest challenge. We identify opportunities for future studies that can develop quantitative models for estimating lodging severity and mapping lodging risk using RS data. Abstract: Publication date: May 2019Source: ISPRS Journal of Photogrammetry and Remote Sensing, Volume 151Author(s): Yusheng Xu, Richard Boerner, Wei Yao, Ludwig Hoegner, Uwe Stilla To ensure complete coverage when measuring a large-scale urban area, pairwise registration between point clouds acquired via terrestrial laser scanning or stereo image matching is usually necessary when there is insufficient georeferencing information from additional GNSS and INS sensors. In this paper, we propose a semi-automatic and target-less method for coarse registration of point clouds using geometric constraints of voxel-based 4-plane congruent sets (V4PCS). The planar patches are firstly extracted from voxelized point clouds. Then, the transformation invariant, 4-plane congruent sets are constructed from extracted planar surfaces in each point cloud. Initial transformation parameters between point clouds are estimated via corresponding congruent sets having the highest registration scores in the RANSAC process. Finally, a closed-form solution is performed to achieve optimized transformation parameters by finding all corresponding planar patches using the initial transformation parameters. Experimental results reveal that our proposed method can be effective for registering point clouds acquired from various scenes. A success rate of better than 80% was achieved, with average rotation errors of about 0.5 degrees and average translation errors less than approximately 0.6 m. In addition, our proposed method is more efficient than other baseline methods when using the same hardware and software configuration conditions. Abstract: Publication date: May 2019Source: ISPRS Journal of Photogrammetry and Remote Sensing, Volume 151Author(s): Fatma Haouas, Basel Solaiman, Zouhour Ben Dhiaf, Atef Hamouda, Khaled Bsaies Change detection monitoring on multi-temporal remote sensed images is a persistent methodological challenge where the Dempster-Shafer, or evidence, Theory (DST) has been often applied. This paper presents a new method based on the use of DST for mining bi-temporal remotely sensed images change. The main idea is based on the investigation, analysis and interpretation of different types of conflict between two bi-temporal mass distributions. The reasoning process is focused on the conflict significance and its “partial” causes. In fact, the global conflict that occurs during the joint exploitation of multi-temporal images gives general and non-sufficiently concise information. However, the partial conflict provides rich and important information with regards to the disagreement between knowledge sources. For computing the partial conflict between focal elements, the geometric representation of mass distributions is exploited. The obtained conflict measures, caused by change, are analyzed latter by a new algorithm for drifting binary change map and identifying change directions. The effectiveness and reliability of the proposed approach are shown through experimentations on simulated changed images as well as using multi-temporal Landsat satellite images where qualitative criteria as well as quantitative measures are applied. The performances of the proposed approach, in terms of changed area recognition, are compared to three different and widely used conflict measures: the Empty-set mass, the Jousselme’s distance and the Cosine measure. It is shown that the developed change detection approach outperforms these conflict measures. Abstract: Publication date: May 2019Source: ISPRS Journal of Photogrammetry and Remote Sensing, Volume 151Author(s): Christian Geiß, Patrick Aravena Pelizari, Lukas Blickensdörfer, Hannes Taubenböck We follow the idea of learning invariant decision functions for remote sensing image classification with Support Vector Machines (SVM). To do so, we generate artificially transformed samples (i.e., virtual samples) from available prior knowledge. Labeled samples closest to the separating hyperplane with maximum margin (i.e., the Support Vectors) are identified by learning an initial SVM model. The Support Vectors are used for generating virtual samples by perturbing the features to which the model should be invariant. Subsequently, the model is relearned using the Support Vectors and the virtual samples to eventually alter the hyperplane with maximum margin and enhance generalization capabilities of decision functions. In contrast to existing approaches, we establish a self-learning procedure to ultimately prune non-informative virtual samples from a possibly arbitrary invariance generation process to allow for robust and sparse model solutions. The self-learning strategy jointly considers a similarity and margin sampling constraint. In addition, we innovatively explore the invariance generation process in the context of an object-based image analysis framework. Image elements (i.e., pixels) are aggregated to image objects (as represented by segments/superpixels) with a segmentation algorithm. From an initial singular segmentation level, invariances are encoded by varying hyperparameters of the segmentation algorithm in terms of scale and shape. Experimental results are obtained from two very high spatial resolution multispectral data sets acquired over the city of Cologne, Germany, and the Hagadera Refugee Camp, Kenya. Comparative model accuracy evaluations underline the favorable performance properties of the proposed methods especially in settings with very few labeled samples. Abstract: Publication date: May 2019Source: ISPRS Journal of Photogrammetry and Remote Sensing, Volume 151Author(s): Maitiniyazi Maimaitijiang, Vasit Sagan, Paheding Sidike, Matthew Maimaitiyiming, Sean Hartling, Kyle T. Peterson, Michael J.W. Maw, Nadia Shakoor, Todd Mockler, Felix B. Fritschi Crop biomass estimation with high accuracy at low-cost is valuable for precision agriculture and high-throughput phenotyping. Recent technological advances in Unmanned Aerial Systems (UAS) significantly facilitate data acquisition at low-cost along with high spatial, spectral, and temporal resolution. The objective of this study was to explore the potential of UAS RGB imagery-derived spectral, structural, and volumetric information, as well as a proposed vegetation index weighted canopy volume model (CVMVI) for soybean [Glycine max (L.) Merr.] aboveground biomass (AGB) estimation. RGB images were collected from low-cost UAS throughout the growing season at a field site near Columbia, Missouri, USA. High-density point clouds were produced using the structure from motion (SfM) technique through a photogrammetric workflow based on UAS stereo images. Two-dimensional (2D) canopy structure metrics such as canopy height (CH) and canopy projected basal area (BA), as well as three-dimensional (3D) volumetric metrics such as canopy volume model (CVM) were derived from photogrammetric point clouds. A variety of vegetation indices (VIs) were also extracted from RGB orthomosaics. Then, CVMVI, which combines canopy spectral and volumetric information, was proposed. Commonly used regression models were established based on the UAS-derived information and field- measured AGB with a leave-one-out cross-validation. The results show that: (1) In general, canopy 2D structural metrics CH and BA yielded higher correlation with AGB than VIs. (2) Three-dimensional metrics, such as CVM, that encompass both horizontal and vertical properties of canopy provided better estimates for AGB compared to 2D structural metrics (R2 = 0.849; RRMSE = 18.7%; MPSE = 20.8%). (3) Optimized CVMVI, which incorporates both canopy spectral and 3D volumetric information outperformed the other indices and metrics, and was a better predictor for AGB estimation (R2 = 0.893; RRMSE = 16.3%; MPSE = 19.5%). In addition, CVMVI showed equal prediction power for different genotypes, which indicates its potential for high-throughput soybean biomass estimation. Moreover, a CVMVI based univariate regression model yielded AGB predicting capability comparable to multivariate complex regression models such as stepwise multilinear regression (SMR) and partial least squares regression (PLSR) that incorporate multiple canopy spectral indices and structural metrics. Overall, this study reveals the potential of canopy spectral, structural and volumetric information, and their combination (i.e., CVMVI) for estimations of soybean AGB. CVMVI was shown to be simple but effective in estimating AGB, and could be applied for high-throughput phenotyping and precision agro-ecological applications and management. Abstract: Publication date: May 2019Source: ISPRS Journal of Photogrammetry and Remote Sensing, Volume 151Author(s): Ruitao Feng, Qingyun Du, Xinghua Li, Huanfeng Shen Highly accurate registration is one of the essential requirements for numerous applications of remote sensing images. Toward this end, we have developed a robust algorithm by combining and localizing feature- and area-based methods. A block-weighted projective (BWP) transformation model is first employed to map the local geometric relationship with weighted feature points in the feature-based stage, for which the weight is determined by an inverse distance weighted (IDW) function. Subsequently, the outlier-insensitive (OIS) model aims to further optimize the registration in the area-based stage. Considering the inevitable outliers (e.g., cloud, noise, land-cover change), OIS integrates Huber estimation with the structure tensor (ST), which is an approach that is robust to residual errors and outliers while preserving edges. Four pairs of remote sensing images with varied terrain features were tested in the experiments. Compared with the-state-of-art algorithms, the proposed algorithm is more effective, in terms of both visual quality and quantitative evaluation. Abstract: Publication date: May 2019Source: ISPRS Journal of Photogrammetry and Remote Sensing, Volume 151Author(s): Benqing Chen, Yanming Yang, Dewei Xu, Erhui Huang For shallow water depth retrieval from high spatial resolution satellite images, although numerous empirical models have been developed, it remains impossible to estimate shallow water depths without collection of required ground truth depth. To address this limitation, a new physically based dual band algorithm is developed to estimate shallow water depths using blue and green bands from high spatial resolution multispectral image with no ground truth. The dual band log-linear model is first analytically formulated, which then is used for shallow water depths retrieval by solving all unknown model parameters based on different types of sampling pixels directly extracted from the multispectral image. The adjacent pixel pairs from the intersecting edges of different bottom types across various depths over shallow water area, are employed to calculate the optimal band rotation coefficient unit vector by minimization method. On the basis, the bottom parameter is estimated through the pixels from the coastline. Additionally, the pixels from various depths of same bottom type are also employed to achieve the blue to green band ratio of diffused attenuation coefficient. The sum of the diffuse attenuation coefficients of green band for upwelling and downwelling light is estimated by QAA and Kd algorithms. To evaluate the performance of the proposed algorithm, the GeoEye-1 image covered Jinqing Island and the Chinese Gaofen-2 image across Kaneohe Bay are chosen to achieve shallow water depth by using the proposed algorithm after geo-rectification and atmospheric correction. The validations using the actual water depths show the overall root mean square errors (RMSEs) for the derived water depths are 1.18 m for Jinqing Island and 1.34 m for Kaneohe Bay respectively. Compared to the Lyzenga empirical model, the developed approach can generally achieve slightly better results for shallow water depths with no ground truth data. Finally, the effects of the variation in the model parameters to water depth retrieval are discussed and analyzed.